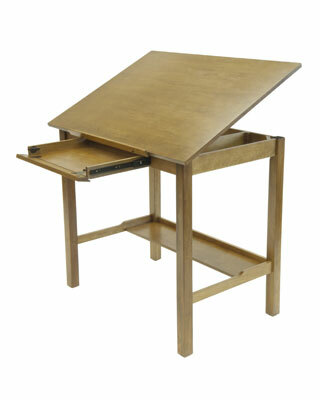 The handsome, minimalist design of the Americana II Drafting Table complements any home or workspace. Its versatile construction accommodates art supplies, computers and more. The main work surface adjusts in angle from flat to 45 degrees. Features include a large drawer with a fold-down drawer front for use as a computer shelf and a large lower storage shelf.